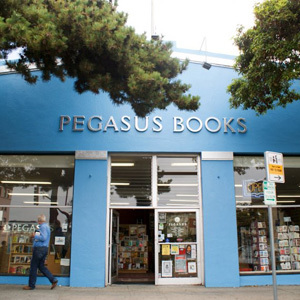 Pegasus Books Downtown is a spacious, light store at the corner of Shattuck and Durant in Downtown Berkeley. Our Downtown store offers an ever-changing mix of new and used books, overstock books, art cards and thoughtfully chosen magazines. We pay top prices for your excellent books and music, for cash or trade. We host author and community events. On accessibility: We are located three blocks from Downtown Berkeley BART. Our space is wheelchair accessible. Our space is not scent-free. We have LED lights. We do not have a public bathroom during our usual store hours. For events only we have a wheel chair accessible gender neutral bathroom. If you have any questions, comments, or concerns about accessibility please contact kyliemax by sending an email to shattuck@pegasusbookstore.com with the subject line “attn: kyliemax”.